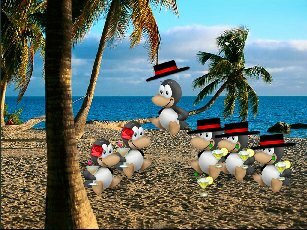 Well, we are back with the Penguins and another adventure. This time they are visiting Spain enjoying the hit sensation "The Ketchup Song" by Las Ketchup. I know they are having a great time and we hope you will have one as well with this desktop theme.